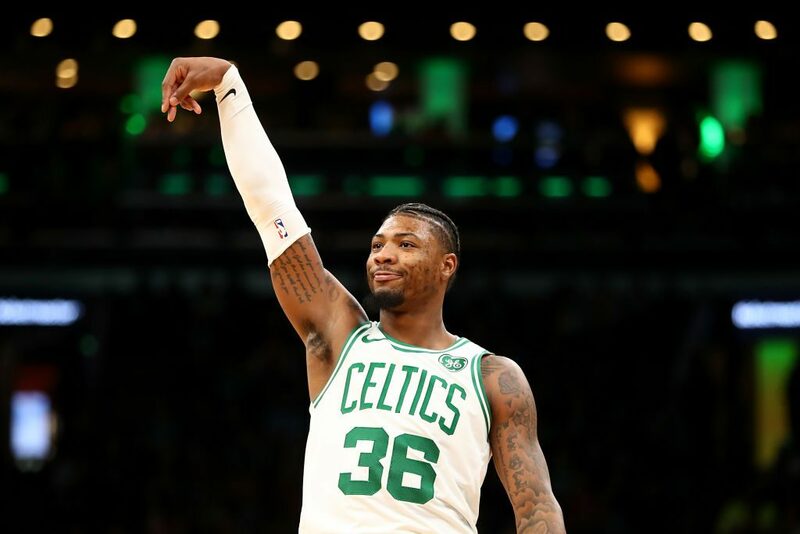 Marcus Smart is an elite defender and selfless leader whose contributions often can’t be found in a box score. What can be found in a box score is his shooting percentage, and before this season it wasn’t pretty. Wildly inconsistent shooting has been the one glaring weakness in Smart’s game since he entered the league four and a half years ago. He shot 29% from three in his first four seasons in the NBA, and made it clear early on that he wasn’t going to stop launching. Despite the percentage, he’s already cracked the Celtics’ all-time top 10 in three pointers made after racking up over 1,000 attempts in less than five years. Fans all over New England have become accustomed to yelling “no Marcus! !” at their television multiple times a game, often followed by an opposite reaction when he draws a charge or comes up with a steal moments later. We’ve all imagined how great he could be if could just score with some efficiency. Well here we are. This season, Smart is drawing rave reviews from Celtics fans and media with and without the ball in his hands. He’s shooting 35% from beyond the arc, a career-high for him and the same percentage currently held by Kemba Walker, LeBron James, Chris Paul, and Klay Thompson. Thompson is obviously having a down year by his standards, but none of those guys have ever been considered bad three-point shooters. If Marcus can stay in that class while continuing to be one of the best defenders in the game, his value to this team will skyrocket. This is satisfying to watch on so many levels. Regardless of his shooting percentage, Marcus has never lacked confidence. Now he has an actual functioning jump shot to back it up. His ability to get under his opponents’ skin is now effective on both ends of the floor. The best part? He’s adding another element to his game after signing a $51 million contract. That’s a guy who doesn’t settle and continues to play with something to prove. His work ethic and passion were a big reason why the Celtics were comfortable giving him all that money, and it’s already paying off. The C’s are now 14-5 in their last 19 games after going 10-10 in their first 20. They’ll be back at the Garden on Wednesday to take on a tough Pacers team.